Discovery Chests Loans, representing seven different world cultures, are a component of the JOURNEY Arts in Education Program. Educators, high school clubs, PTA groups and summer schools are encouraged to borrow the chests for their classrooms, club meetings, school fairs and fundraisers. 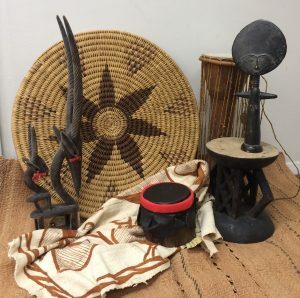 There are over 30 cultural artifacts in each bin that include items from household goods, artworks, cultural texts and books, clothing and traditional items. Discovery Chest are available FREE of charge including transporting of chests, to school districts partnering in the JOURNEY Arts in Education program. There is a borrowing fee of $50/$75 for a 2 week loan for schools that are NOT in the JOURNEY program. The borrowing period is extendable upon availability. Other – Tell us what you are looking for and we may be able to make a chest to suit your needs! If you’ve borrowed a Discovery Chest recently, please let us know what you thought!